Courtney Kirschbaum is a human development and high performance expert who specializes in helping young professionals choose the right career and achieve mastery in it. She also successfully completed her own career transition later in life when she left the corporate accounting world to found CK Consulting. Now she is launching a new project, Job Hunt School, to impact even more young professionals. 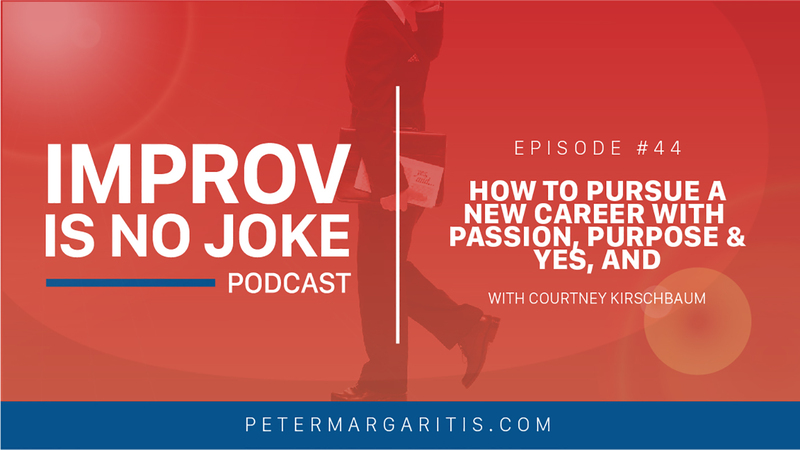 We discuss how pursuing passion and purpose help during career transitions, how the principles of improvisation will help you during the interview process, and the stress epidemic in the U.S.
Courtney started consulting because she saw a leadership and development gap. Students in college aren’t being properly trained to transition from a collegiate environment to a corporate environment, or any other business environment. Expectations in a corporate environment, and how to fulfill them. Office politics, and how to navigate them. Empathy for business owners, and how to develop it. The value of feeling like you have a stake in your job, and how to attain that. Consulting is great, but her impact is limited to the number of people she can work with on any given day. She’s reaching more young professionals through Job Hunt School. Job Hunt School is a program for recent graduates who are spinning their wheels and going through the motions, who feel like they’re doing everything they were taught, but aren’t gaining any traction. You know how to play the game, you went to the career center and learned to write a resume, but you haven’t mastered the game. Courtney’s program will offer the last 10% you need to master the game, and that last 10% can make a 100% difference in your career. If you’re interested in securing your spot in Job Hunt School, or you know someone who will be graduating soon, head over to JobHuntSchool.com. The doors open in April 2017! 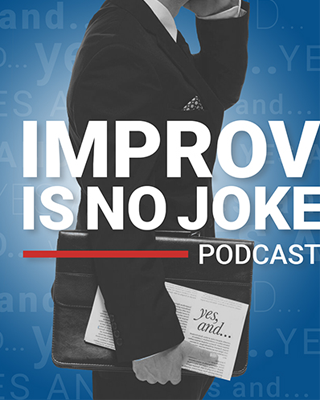 Peter: Welcome to episode 44 of Improv is no Joke podcast. Thank you very much for downloading this episode. Today’s guest is Courtney Kirschbaum, who’s a human development and high performance expert who specializes in helping young professionals choose the right career and achieve mastery in it. Courtney grew up in a small town with only two stoplights and now she’s an international speaker and presenter who works with future thought leaders helping them to transition into and build solid foundations in their careers. Courtney has a tremendous amount of energy, which is contagious, and she is funny too. Some of her analogies are hilarious. For example, early in the conversation we started talking about using social media to promote yourself at conferences where you will be speaking. I give her high praise on our social media skills and she replies “I don’t think I’m very good because I keep comparing myself to 14 year olds and they’ve mastered social media by the age of six.” Well I guess it’s funnier when she tells the story. Courtney discusses the transition from college to the workplace, which I referred to as from backpack to briefcase. College students are attending classes in their pjs one day and having to show up to work at a professional job the next day, and no one has explained how to bridge that gap. What are the expectations? What is the significance of office politics in your career? Questions like those. Courtney founded CK Consulting to fill the leadership and development gap and train people to work in their core competencies and become leaders and high performers. She trains and coaches Millennials, helping with him transition into and build solid foundations in their careers. Courtney’s straight-talking style helps her connect with the audience by combining compassion, humor, and real work experience to provide tools and techniques so they’ll be able to be successful and productive in their careers. I would be remiss if I didn’t mention that Courtney was the closing speaker at TEDx Edmonton in 2014, and was selected as one of eWomenNetwork’s top five speakers in 2013. You’re going to enjoy this episode because Courtney’s energy, as I’ve stated earlier, is very contagious. If you have been listening to my podcast for a while, you know one of my goals with his podcast is to help you begin to make changes in your work and personal lives so you can better connect with others and create meaningful relationships. Many people have said it takes 21 days to start a habit, which I learned is incorrect from Dr. John B Molitor, PhD. John is a professor of psychiatry at Michigan State University, and the President of NSA Board of Directors. He said that the research shows that it takes 66 days to create a habit. So now we gotta put in some extra work to create that muscle memory. That’s why I created the Yes, And challenge: to help keep these principles in front of you so you can build up your improvisational muscle. To sign up, please go to PeterMargaritis.com and scroll down to the Yes, And challenge call to action and click to register to begin building the productive habit of Yes, And and the principles of improvisation. And remember to show your experiences on twitter using the hashtag #yesandchallenge. If you’re unsure of what the Yes, And challenge is all about, I discuss this in detail in episode 0. Go back and take a listen. Remember you can subscribe to my podcast on itunes, stitcher, and google play. 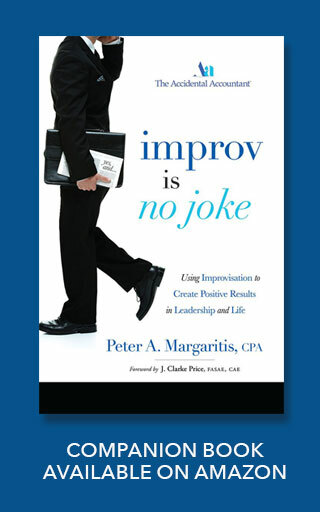 If you’d like to purchase an autographed copy of my book Improv is no Joke: Using Improvisation to Create Positive Results in Leadership and Life, for $14.99 with free shipping, please go to my website, PeterMargaritis.com, and you’ll see the graphic on the homepage to purchase my book. Please allow 14 days for shipping. You can also follow me on social media. You can find me on Facebook, Twitter, LinkedIn or Instagram. With that said, let’s get to the interview with Courtney Kirschbaum. Peter: Welcome, Courtney, to my podcast. Thank you very much for being a guest and taking time out of your busy schedule. Courtney: You are very welcome. It’s great to be here. Peter: It’s great to see you. Just so the audience knows, I’ve known Courtney now probably going on three yearsish. I am terrible with time. it could be three days, I think is like three years. Courtney: I think you got it. It’s three years. Peter: We met because she does some speaking for the business learning institute, and we met I believe it was at the NABA, national association of black accountants, conference. It was our first time that we met and you were preparing for your TEDx presentation at the time. Courtney: That’s right. Boy, that takes me back a little bit. Courtney: She is wrong. Nailed it. Peter: and I’ve kind of gotten to know you over the last three years, a lot through social media because I follow you you follow me. One thing I love is, when you would arrive to a city, you take out your smartphone and video yourself and put it out there on your social media. “hey I’m going to be at this conference, I’m doing this, hope to see you all.” It just yet brought that energy and I have to believe those meeting planners just absolutely love that. Courtney: I feel like I’m not very good with social media because I’m always comparing myself to people who were 14 and 15 who were absolute you know masters at it and have been since they were six, but I kind of started realizing that I know what I like to see and what kind of would connect to. So that was like I was so proud of myself when I did that, and I know exactly what you’re talking about. I was at a conference in New York when I did it and I was in Las Vegas, at the NABA conference, and when you’re at conferences people sometimes don’t feel like they can come up to you, or they wouldn’t even have a reason to, but I think that the thinking is “well if she’s taking a video of herself and putting it on her facebook page, I can go chat with her,” and they feel like they maybe they already know you. So that’s a definite benefit. If you’re thinking about it and want to bite the bullet, it opens the door for people to connect. Peter: and that’s great advice. Actually, I did try it, but I learned a very important lesson: you have to stop and record yourself, you can’t walk, because I mowed over three or four people trying to record myself walking, trying to be cool walking through an airport. So I now pull myself off to the side to record. Courtney: Good call. Good advice. Peter: Let’s start our conversation by letting the audience know a little bit more about who Courtney Kirschbaum is. Courtney okay, I’ll try to keep it brief. I think things really got exciting in my life when I left my career. The one that I thought would carry me through the course of my life, and that kind of now is an old-school, conventional way. I’m out of a small town, with like two stoplights. Courtney: Yeah, and anybody who’s from a small town that’s what they’re thinking in their head. Then I went to college in a larger city, and I really always wanted to see the world. So I took a very conventional route. I got a desk job and then I got another desk job with the goal of getting overseas and living an exciting life, and I was lucky. At some point in my 20s, somebody turned me onto personal development, and my first thought was this is great. This is everything I need to know about work. Why didn’t they teach me this in college? Courtney: and I really was like this is this is everything you need to know. I mean it was about confidence and self-esteem and how to think like a winner and how to be successful. So I kind of used that to get to move forward in my career, and my career consisted of working for big four accounting firms. I started with KPMG and spent really most of my career with them, and then their their spin-off which was BearingPoint, and when you start you don’t know anything. I think anybody who’s even been in the work world for a few years kind of recognizes “oh this isn’t like it is on TV.” Did you have that experience? Peter: Yes, and actually it seemed, for like the first two or three years, that I was kind of like in a fog. I just want to remember where the bathroom was, and then everything else would figure itself out. Courtney: I’m glad hear you say that, because was everyone as kind of like unprepared for the shift from academic life to professional life? It’s a whole new ruleset. Courtney: and I’ve worked in my family business… I mean, as soon as I could be seen over the counter I was in there. So it wasn’t it like I didn’t have any work experience, but I worked in that career and I figured it out. I had a development book checked out from the library from roughly 1997 to today. I just continued to kind of use these tools, and what astounded me was how few other people did. I would look around and I would think “so how are you feeling about the pace of progress here?” And most people seem to be okay with it and I really wasn’t, and I thought God if I gotta wait 15 years until I get the corner office and have my parking spot near the door, whatever the perks were… that, I think, was kind of what that paradigm was like. This is this all there is paradigm, I think, is what kind of stayed with me even right up to the end. Once I felt like I really got it and was doing a great job and getting what I wanted out of my career, it just seemed like there there was a better way. Peter: Well, you were working for an accounting, and I think still to this day they still have that same kind of pace, that same kind of that energy within the firm, which was one of my challenges when I worked for Price Waterhouse. I had all this energy and the pace was so slow and things were in structure, and I got into the profession late in life. I was 30. I tell everybody I’m Greek. I grew up in restaurants. I grew up in customer service. I was a banker, and then I went into an accounting firm and… I see your energy and I can imagine you were feeling a lot of the same way that I was at the time. Courtney: and a lot of people feel that way, and it’s so common that it’s become the norm and people are like… you know, this is good enough, and at some point it just stopped being good enough. I think this was… I had that moment where I’m like there’s no way I can do this until I’m 55 or 65. So I had that like uh oh I’m in trouble. I quietly ignored that for a few years, until I got lucky. Because the economic downturn actually kind of freed me. I don’t think I would have quit a good job. I think a lot of people wouldn’t walk away from a good situation, and when the economic downturn was kind of like a shadow being cast across the land I thought “I can take a break now,” and BearingPoint basically kind of got chopped up and sold off, and they laid off everyone that didn’t kind of go to another place. There are a lot of people who were laid off and I took that opportunity to take a year off and regroup, and I think everybody should have the opportunity to do that. If I ruled the world, everybody would get their year to figure it out, and that really began a different journey for me. Peter: It’s funny you say that, because I was working Victoria’s Secret catalog, as you remember, not as a model but thank you for thinking of that. And I got downsized, reengineered, restructured, laid off. I didn’t have a year, but I had three months, and after the first few days people would talk to me and all I hear is wah wah wah wah wah. I don’t have a job. And then a couple days after that I went you know what this could actually be the best thing that could happen to me, so I’m going to try to figure it out. I didn’t, but it gave me time to realize what ifs and kind of build a plan on the what-if, and it works. Courtney: It does work, and I’ll tell you the metaphor I thought of when you said that, with what happened to you and what happened to me maybe even greater degree, you’re separated from the herd. Courtney: I think an animal’s like uh oh this can’t be good, I’m separated from the herd. When I watch those nature shows on TV this is when something bad happens, and that’s how you feel. Just to give you an example of how long it took me to retool. I, in the first three or four months, got my ACSM personal training certification, I took a wilderness first responder class… I mean, I couldn’t do nothing. Courtney: It was like I have to do something, so I took all these classes and I continued to get certifications. Now part of that was in an effort to figure out okay what am I gonna do next. I thought I’ll be on ski patrol, because I had just moved to Colorado and I took the wilderness first responder, which is what they require you to have. And I was like… I don’t want to do this, and I loved it. I absolutely loved every minute of it, but I knew that wasn’t for me. And then I got my personal training certification. I’m going to be a personal trainer and I’m gonna help develop people a little bit more literally, and then I was like nah. But the point I want to make from that is people try things… and they’ll say you’re just all over the place, and is that such a bad thing? It’s not, but I do think there is a stigma attached to it. I mean, I didn’t do that when I was young. My mindset was good and right and the image I want to project is somebody who’s got it together, and the person who’s got it together gets a job and gets on the path, and by the time I was in my 30s I’m like okay, some of that was BS, and now I’m doing it my way. And also, just to make sure you get all of my missteps in here, I also thought about becoming a lawyer. Now if my lawyer is listening to this, he’s either like fainted or he’s dying laughing. Courtney: But I think realizing what you don’t want to do is just as important as realizing what you do want to do. Just acknowledging okay this is not for me and I’m gonna keep looking. Peter: Oh yeah, I completely agree. At one time, I wanted to get my certified financial planning credential and I went no… that’s not it, and I tried a number of things until I kind of, well, fell in love with teaching. But yeah, you have to try a lot of stuff and you have to be able to fail, in order to figure out what you’re doing. But as you said, it takes time. Peter: So thinking about your business, and we’ll start talking about that, but you’ve been there done it, and you’re working now with the younger generation. Part of what you do is help them transition into the corporate world. Courtney: Absolutely. I mean my I think my whole purpose in life is I’ve been where you are and I know how awkward it is, I know how confusing it is, I know the mixed messages you’re getting, because it hasn’t really changed all that much. And if you had asked me, even five years ago, what will you be doing… this is not what I would have said. But what what happened for me is I left the corporate world and I thought I would be a one-on-one coach. Peter: I could see that. Courtney: I kind of had this hazy vision of it, you know how it is, but I was very certain that I wanted to take my life in a new direction. So I leave the corporate world and I’m like, I’ll be a coach. And I realized, as much as I love helping people, that’s not kind of the platform that I want to do it in. And I had begun speaking. I was at Lake Louise in Canada. I was at a really great conference there for young women. Most of these young women still in college, the University of Alberta, which is a very good school, and the women at this conference were like the top of the top. Super high performers, very engaged in school, all of it. And I gave two sessions at that conference, made a lot of friends, and some women came up to me afterwards. These young women intimidated me they had their stuff; they had it together so well. If I had my act together as well as you do in college… God knows where I’d be today. They just had it all going on, and everyone I sat down with was anxious and concerned and worried. I don’t know what to do and how do I do this and how do I do that, and I thought nothing has changed. You are the exact same person I was at 20, except you know how to use a smartphone and you have better grades. But I thought this is ridiculous. They’re still not teaching the things that you are really going to need to know when you walk into the job, and not only on the first day but even before that. And another thing I noticed was, at the conference, I was the only independent there. I was the only entrepreneur. Because I was beginning my career, I had gone up there as a loss leader. I had an opening and I’m like I’m there, I’m there, whatever it takes I’ll get there. Every other person there was a corporate executive. They had paid to promote the conference, so sponsored it, and then spoke, and what they had done is monopolized this market of young talent, and the only perspective that the young women there got was a corporate perspective. I have to say that got my hackles up a bit. These women need to hear another perspective, and they’re really kind of not getting it, and they definitely weren’t getting in colleges. That kind of made me think you can go back and and really change the experience for a lot of people. This is unnecessarily hard. There are some lessons in life that that you have to learn. There are gonna be challenges and you benefit from them, but I believe wholeheartedly there are some things that don’t need to be difficult that are kind of made difficult just because there’s nothing there to show them, kind of, this is how it works, and give them a perspective of someone who’s been there. These are the challenges you’ll face, and this is normal, and this is kind of how you can prepare for this. So that’s kind of what got me on this path. A couple conversations with some really bright women, who were a bit scared of kind of going out into the world after graduation. Peter: Can you give me a for example of that. Courtney: I can. I sat down for coffee with this one young woman, and she had applied for a job and been rejected. She described the whole situation and I’m like, wow, you sound perfect for that job. Just right off the top she’s an excellent student, she’s already traveled all over the world. She just has everything going for her, and she said a friend of mine works there and she goes “I feel bad saying this, but I almost feel like my friend is jealous with me or maybe doesn’t want me to get a job there,” and and you could tell it really upset her. She didn’t want to sound egotistical, but I’m like that’s a reality. People competing with each other at work, yeah, it’s a reality, and I said don’t feel bad about saying that. That happens in the workplace, and people become jealous of each other, and maybe they’re not as supportive as they would like to be… so it’s not just like how do I write my cover letter in my resume. It’s more of the kind of political issues, or how people really interact. There’s an image and then there’s the reality, and often times, particularly if you’re kind of in the community, you don’t want to acknowledge some of the more unpleasant aspects of how we work together (or don’t work together) well. You want to go along and get along. As my corporate friends used to say, just drink the kool-aid. Courtney: So I thought that was a really obscure thing, but it’s like yeah that is some of the reality. Not everybody’s gonna want to want to see you get ahead. Another woman told me you “I’m worried about something silly.” She didn’t have a job. She had worked and worked and then she took a summer off, and she’s like “I’m not supposed to have gaps in my resume.” And I thought… says who? She was in pain over this, and I thought you really don’t need to worry about it, but everything seems to be riding on it, and this is true for anybody. You’ve been successful and you want to continue to be perceived as successful, and when that’s threatened… I mean you talked about losing your job. It’s not just a data point. There’s a real emotional impact to that. We have a incredibly strong emotional attachment to… it’s like a triangle: our jobs and our security, but also our self esteem and self respect. Courtney: And I guess that’s the Puritan work ethic, and you know that goes back literally hundreds of years… and I think sometimes people just need to be put at ease, and a lot of what I do and, in addition to teaching and helping people kind of find their direction and also the practical strategies and tactics of getting in and being successful, and being happy. It’s just a little bit of compassion and empathy. You don’t have to be perfect. You can actually be a human. Everybody else is, but you can relax and enjoy the ride a little bit more. Peter: So what’s lacking?When a college graduate goes from backpack to briefcase, what’s the biggest challenge? What’s lacking that they’re not teaching in the universities, but god they need it in the workplace? Courtney: I really think what is lacking is a simple primer on, up until this point in your life, it’s been a completely different paradigm. What they need is a transition. This is the difference between what you’re expected to do and how you’re expected to think and behave in an academic environment, which you spent your entire life in up to that point. Even if you’ve worked, you’ve probably not worked in the same… maybe you were a knowledge worker, but you could be anything. You could have been you know leading tours with outward bound or something. Everybody comes to it from a different place. I was on the phone interviewing a millennial and he said I would have just like liked just one semester of job hunt training. How you really go and, you know, interview practice I was playing tennis one day with somebody who’s a really really good tennis player, an actual pro, and he said, “Courtney, tennis is an easy game to learn, but it’s a hard game to master.” So I feel like they’re kind of being told these things, but they’re not given the finesse: here’s how you write a cover letter, here’s how you write a resume… and those are easy things to write, but they’re hard things to master, and it’s the same thing with with the office politics. Here’s a perfect example: I had a boss tell me once, “Courtney, when I make a decision in this company, I make it based on what would I do at this moment if it was my company,” and that’s a very simple statement but I was like, of course, that gets right to the heart of the matter. The best decision is dictated, and I’m sure there are ethically and morally sticky decisions, but when you’re talking about business the best decision is dictated by if it was me, if it was my company… would I be so liberal with my expense account, whatever the case may be. I think, when you go into that world, you’re still thinking like a student. You don’t have a clue, and you do figure it out, but a course in entrepreneurship, I think, would probably help. Because that makes you think like a business person, and then you have empathy to like the bigger animal that you’re a part of rather than just, okay, go make these copies. You don’t see how the bigger machine works. I worked in Amsterdam for a while, with KPMG, and the guy running the whole show there was actually a very good leader, and we were talking one day and he said “what do you suggest to engage people like at your level a little bit more with what’s going on here?” And I said, you know what would really open people’s eyes to what what the bigger picture is? If you invited someone and included them in your executive committee meeting, because we don’t know. I mean you go in there and you have your Conclave and you come out and there’s a new pope or whatever, and we don’t get it. We’re thinking and we’re trying to solve problems on your behalf when you turned the ship three meetings ago and we we don’t know, and I think a lot of that is driven by people protecting their turf and all of that corporate stuff that goes on. There is a great deal of insight, and what I saw was the old dog saying “these young pups, they’ll figure it out the hard way like I did,” and if I had to figured out the hard way then you’re gonna figure it out the hard way. That’s not changing. And to me I looked at that and I just thought this is ridiculous, and it really did drive me to move out because I thought there’s so much talent here, there are so many smart people who started young and said the way to survive is to fit into this mold. So they remoulded themselves in the corporate image, and then kind of were trained out of bringing their talents to the foreground. It’s like I don’t have time to do that because I have to get this work done and drive their issues forward, and I think that’s a part of the conflict. Peter: Yeah, I agree with you with that, and as you were describing that it takes me to a conversation I’ve had with a number of partners. When we’re talking about new hires, I say you got them in a cube and they’re doing this work, but they don’t know nothing about how this business works. And you don’t really know until maybe you get to be between manager and senior manager, and so why don’t you take these kids and say this is your cube, you’re hanging your shingle here, your area has to be profitable for the firm and I’m going to teach you how the firm maintains its profitability, I think there’s so much more ownership that would be taken on by that new staff vs yeah I’m working for this company and I’m just doing what they’re telling. Versus yeah my area is profitable, this is what I’m doing, and this is how I’m doing it. And to your point, yeah, let me have some information that’s coming from the meetings. What’s management thinking? I’m not going to give them all the dirty details, some of that stays up top, but some of some of the day in and day out information should be shared. I think that gets emotional ownership and that emotional equity into the organization. Courtney: I completely agree. I think it’s the difference between teaching people to think like workers and teaching them to think like they have a stake, and one of the big things that I do and I work with anyone is entrepreneurial mindset. I think people are a little bit too submissive. It’s like I’ll do anything to get the job, I’ll be anything you want me to be, and sometimes without even realizing they’re doing it and it’s no good for them and it’s no good for whoever they’re gonna work for, because they’re never gonna reach their potential if they’re just like well just tell me what you want me to do. The big thing is vision. I think, if you’re driven by a big picture of how you want things to end up, even if that changes (and it always does) that is one of the most clarifying, motivating things any individual can do. What’s the big picture here? Where are you ultimately going? Maybe you’re gonna go through KPMG or a couple of other big four firms before you get there. Have a bigger plan, and wherever you’re working at any given time should be kind of part of your plan, not just you being part of their plan. Peter: And having that plan, but being very adaptable, because the landscape does change, and sometimes we we have that plan and we may be so rigid in that thought process that we’re not willing to maybe take a chance and go into a different direction. Courtney: I completely agree. Or we’re stigmatized because we think, well, I committed to doing this and I’m supposed to be doing this. I was talking to someone a few years ago and they said that their daughter was in the final year of med school and she was like “I don’t want to do this… I don’t. I just know that I don’t want to do this,” and her parents were like well you have to finish… and ten years ago I would have thought, well, yes she has to finish, but now I wouldn’t. I’d be like this person has realized that this career is not for them, and yes they’ve made an enormous commitment… and, ultimately, she became a doctor, but she stopped. She was a doctor for a number of years and she got out and she went and did something else. I think she actually stayed in that kind of a medicalish profession, but I kind of thought… I get that there’s this commitment to finish, closure, and all of these things… and you shouldn’t quit, but the fact is sometimes you should quit. Courtney: I think we need to give people a little bit more space to quit in, and that is not something most people think is right or want to hear but there’s a place for being able to say this isn’t working, this isn’t right for me, and I’m going to move on. Peter: Because, when you stay, in that situation, it becomes a detriment to your health and to your mental stability, at times. We can get trapped and we’ve got a mortgage, and we’ve got three kids, and they’re all in braces, and all of that… but it does take a toll on your health, and I’ve got a number of friends who work in very stressful jobs and I hear it all the time. “If I can just make it past this point…” and I’m thinking that shouldn’t really be the phrase that’s coming out… it’s like I love my job that I love going in, but now I just got to get past this point and then I can maybe retire do something differently. And I’m going maybe you should take the jump sooner. Courtney: I cannot tell you how many people I’ve seen deteriorate, and myself included, as work stresses them out. And any doctor will tell you that there is an epidemic of what they call nonspecific inflammatory disease, and its people showing up in doctors offices saying I don’t feel good, I’m sick, I have all these symptoms… and it’s stress, and it has literally become epidemic. At the moment, I’m looking up a word on my phone because I want to leave this with your listeners. I was, again, somehow being good at attaching to some kind of media, and they were talking about an epidemic, which is increased from 2000 to now, of death by work in Japan. Courtney: Death by work. I’m not making this up. It is an epidemic in Japan. It’s called Karōshi. In Japan… I lived in Tokyo for a year, and it is an amazing place with incredible people… and everyone there is committed to work in a way that makes the Puritan work ethic look like Dazed and Confused. Courtney: It is incredible, and they will work themselves to death. I can remember. I would walk from where I lived to a subway station, and you would see people sleeping in their cars, business people, because they had worked so late or so hard that they didn’t have time to drive home. So they slept in their cars and they were just going to get up and go do it again. That wasn’t at all uncommon, and you know we’re not far from it. It’s frequently suicide, and I mentioned doctors earlier, and it is not uncommon. This is taking a bit of a dark turn, but I feel like people need to talk about this… because I know they’re thinking it. It’s not uncommon for doctors, when they’re not yet fully practicing but they’re in the emergency room and they’re working these incredibly long shifts… the suicide rate among those doctors who are working these marathon shifts actually spikes, and it’s over work. It’s all this pressure to deliver, and it’s so common in japan they’ve actually come up with this name for it, Karōshi. So I can’t help but think… how far are we from the point where our dignity and who we are is so tied to our work performance that we will literally sacrifice one for another, like they are in Japan? And they’ve actually started to address it, and some businesses are doing something they call premium Friday, where they send workers home on Friday. They’re kind of pushing them out the door to say, yeah, we recognize we have a problem here. It’s gone too far… and that’s sobering. Peter: That is. One of my jobs in victoria secret, I was international circulation manager, and we were trying to open up the japanese market. So this is mid 90s and, yes, I can attest. I saw that work ethic. I didn’t think it was very efficient, but they would work hard, work long hours (12 14 15 hours), and then the stereotypical Japanese businessman would still want to go out to the wee hours of the morning. You can’t go at that pace, and I would say that maybe the Millennials are helping us to get out of this because there’s more… I don’t like this word: work-life balance. I always got work life management, because the only time we’re in balance is when we’re dead, or university professor. Outside of that, there’s no balance. I think they are helping us to see that there’s more to life than just the job. Courtney: Let me tell you, I love Millennials. I need to be an honorary millennial. I think they are really going to save us from ourselves, in many respects, for that very reason. They are not willing to sacrifice their well being for their work success. They bring, I think, a great and refreshing attitude. The optimism… and I know I hear people who work with Millennials say “Well these Millennials…” and I’m like, okay, that’s not a millennial characteristic. Any 20 or early 30 year old – you, me, anyone – is gonna do that. That’s just part of being at that age, and I think that’s an important distinction. Every 20-year-old in history had a lot of stupid tickets, which they played, including you. We all need just give them a pass there. I think they bring optimism, incredible discretion about what they’re willing to be subjected to, which is not karoshi, and just a new way of working. I’m inspired. I am absolutely inspired. I was giving a talk a few years ago. I don’t know how I got into this, but I was speaking to the Colorado Association of Chiefs of Police. Courtney: I know. It’s not where I would have expected to be, but it was great. It was a wonderful group of people and they asked me to come speak about getting good talent to join police forces. They’re really struggling to get the right people in there, and it’s about community policing. It’s about communicating a new message around policing, and I do a lot of research for this because this isn’t a field that I’m familiar with, and I learned a lot. I interviewed a Colorado State Patrol officer and he said there are so many great things about Millennials in terms of community policing, and he said but I can’t get them to work overtime. I said well what do you need? And he said “I need somebody to sit in a patrol car at a construction area on the interstate to kind of make people aware, slow it down, behave yourselves.” All they have to do is sit there. It’s the easiest job in the world, and he said it’s an overtime kind of thing, and he said he can’t get anyone to do it. They want to have their lives and they want their time, and I sympathize with his predicament but I thought… isn’t that how it should be? Courtney: I mean it was a good thing. Isn’t that the other end of the spectrum from karoshi, where you’ve worked herself, literally, to death. Peter: Yeah, I hold the same thoughts about the Millennials. Working with seniors when I was at the University and pushing them out the door… that was one of my favorite things to do, and I would always tell them that you guys got the world by the tail. Just go a little slow. Just just back off the pedal just a little bit in those early years, but you guys are great. As you’re describing this, I’m thinking that’s the problem right now, in the accounting profession, with succession planning. Because they see these partners working themselves to death, and they don’t want to have anything to do with it. It’s incredible. These guys are coming out of college, they’re going to work for the big four, and they’re leaving after three years, which is kind of typical back in the day. But what we’re seeing is, when they leave, they haven’t taken the CPA exam, nor will they take the CPA exam. They’re going to do something simpler like brain surgery or something… no you guys are nuts! Peter: I can’t work like this! There’s no balance. It’s just all work-driven at that karoshi amount. Courtney: Yeah. I was gonna mention that the number of recent graduates taking the CPA is in decline, and it’s because they don’t want to grind away and study and study and study… and they see it. And honestly you say they look at the partners and they’re like I don’t want to do that. That’s exactly one of the main drivers of why I got out. Of course, I had to bring another element to it. As a woman, I looked at the path for women and I looked at the women who were partners, who were directors in the firm, and my exact thought was ‘no way, no how, is that at the end of the road I’m on. it’s just not worth it.’ So I have to applaud them for having… whether it’s foresight or intuition or whatever they’re bringing to bear to say “no, I don’t want to be on this road if that’s where this road leads.” And I think one of the last companies I was working with told that one of their benefits was a year-long sabbatical, when you make partner or director (depending on the path you were on). You could opt to take a year off, and things like that really make me think that companies do get it. So I see some responsiveness. It’ll be interesting. I read something last night that said by 2025, seventy-five percent of the workforce will be Millennials. Courtney: I can’t wait for that! In a blink, we’ll be there. Peter: Yeah, because we’ll be a lot older. When I do talk about the generations with audiences at times, I say yeah we all complain at times about the Millennials. Remember, you baby boomers out there, you’re the ones that raised them. Peter: And they’re all going “no, not my kid.” No. You all raised them. The baby boomers raised them, so quit complaining about them. Courtney: It’s on you, that’s right. You put them out there into the world, now let’s work with them. They take a lot of heat for it, but I hope their optimism will lift us all, and I think it will. I really do. Peter: It was their money. And when you think of millennials we have this picture, but I try to shape that picture a little differently and say one person’s name: who’s a millennial, some guy named Mark Zuckerberger? Peter: Zuckerberg… he’s a millennial. Courtney: He’s like the ultimate millennial. Courtney: Like upwards of seventy percent of Millennials want to be entrepreneurs, and I think Mark Zuckerberg is like the ultimate entrepreneur, right? He spun up his business in college and now he’s he’s iconic. Peter: And they can do it because of the way technology has changed. I mean technology… whenever I got to Panera or Starbucks the laptops out… and they’re all working. Courtney: I mean but isn’t that kind of wonderful? I could remember sitting in my cubicle, longer ago that I’m gonna admit to, and you had your radio and you had your DOS-based screen (now I’m really dating myself). Now you could set at the coffee shop and get the same thing done. Peter: Right. You could work on your phone, you can read on your phone. I officiated a wedding for my goddaughter last year, and and she’s a millennial, she’s in the mid-to-late 20s, and we were talking about the vows. I asked if they had written their own vows, and they went yes. So when it came time for the wedding, they both took out their phone, and they had the vows on their phone… which made me really feel old because I was officiating using an iPad on like a 30 font so I could read. And they’re looking at these little letters without glasses. I’m going Wow! But it was it kind of cool. That was really kind of sobering in a lot of ways, but yeah. Courtney: I would give anything to have a picture of that: you with your iPad and them at their phones. Peter: Uhhhh I bet you I can get it to you. Courtney: That’s a modern wedding. Peter: I have not seen all the pictures, but I will text my goddaughter and see if she can send me that one, if it exists. I’m sure it does. Courtney: I mean it really does capture the times, doesn’t it? Peter: Yeah, it really does. So you present at a lot of conferences, you work with a lot of groups as relates to this career path, the consulting side of your business, but you’ve got more than just that out there. You are about to launch something you’ve been working on for quite some time now, I believe. You’re about to launch The Job Hunt School. Tell us about that. Courtney: Ah, Job Hunt School! This is my baby. That’s the metaphor I’m using. Job Hunt School was born out of, actually, my first program, Original Experience, which is a program kind of to help people figure out their vision. What do I want to do? I’m out of school, I’ve tried some jobs, I’m kind of not sure which way to go. So when I was working with this group of people in Original Experience – I called him the originals – they would call me or text me or message me or facebook inbox me and say, “Hey I’ve got a job interview tomorrow. What do I do about this? Will you look at my cover letter? Will you look at my resume? Should I include this? They want to know what my salary is, should I tell them?” and I kept having the same conversation over and over again. Last December, I was home in Virginia with my family and I had one of these. Eleven o’clock I get a message and I just thought you have to address this, because every single person you know in this age group, sooner or later, comes to you with these questions. Again, it’s that anxiety. I really want this job, it’s perfect for me, but I have no idea how to get from where I am to the desk in that office. Or I do, but I’m still insecure and unsure and I don’t want to blow this, so they’re under ton of pressure. I grabbed a cup of coffee, I sat down with the legal pad, and I started making notes. And I had a name for it, I guess, by January, and I naively thought I would have it out by June… but nevertheless, and it just morphed into this idea. The purpose of job hunt school is to have something for that person recently graduated, up into their 20s, who is spinning their wheels and is going through the motions and doing all the right things… but again, they know how to play the game but they haven’t mastered it, and they’re suffering for that. So from soup to nuts, that’s what Job Hunt School offers. Peter: So let me ask you, does Job Hunt School address this issue: I had an earlier podcast, a woman by the name of Brette Rowley, who’s a career coach. She talks a lot along the same lines that you are, but she made a comment that she works with the same type of group, primarily women, about negotiating salary. Peter: And she made a comment about “there’s so much money being left on the table because we don’t negotiate salary,” which can be very intimidating to that job applicant, especially if they’re going into a senior role, a more senior role, and the salary range is going to jump pretty substantially. How can I negotiate? How can I? And I’m going you can because you have to think about the level that it says. I’ve got a little bit of an HR background because that was part of my undergrad. I’m going you have to look at the compensation matrix. You want to come in probably around the middle, which gives you a place to grow, but they might be trying to bring you in at the bottom… so yeah, you should negotiate. Courtney: It’s like anything. You’re intimidated by anything you don’t how to do or that you’ve never been trained in, and I think what compounds everything in this part of your life is, collectively, people kind of expect you to know what to do. So there’s this feeling like I’m supposed to know how to do this. You know when you’re sitting around and everybody’s looking at each other because nobody knows what the person who’s talking is talking about, and you’re like is it just me? Am I the only one who zoned out? And then it becomes, and this is the word, it becomes like you’re a little bit of shame that maybe you don’t know something you should know. So you’re just going to shut up and take what they give you and it’ll all be good, but take that same person and set them down and say I’m gonna train you how to do this. It’s just like tying your shoes or riding a bike. It’s just like anything else you’ve learned, but it’s like once you get into the work world we’re all in competition so let’s not share our secrets because that money you negotiate for may be money that could have been mine! Courtney: So there’s this competitive atmosphere, and they just need to know how to do it. Nobody tells him the rules, nobody tells them the little secrets – let me tell you what’s going on backstage, let me tell you how HR thinks, let me tell you kind of how all this is set up. They just know what they saw in the movies or what they picked up from their parents, or if they had an internship somewhere. When you have to do anything and you’ve never actually been sat down and said okay, here you go, negotiating 101… you are going to feel awkward and uncomfortable. They talk about women having more difficulty negotiating than men. Whatever your default point is, it’s something that could be taught and that’s that was the whole point of the program. Just to pick the things out that caused the most anxiety. For example, rejection. Everyone flips out when they apply and they don’t hear anything. Courtney: There are some reasons for that, but it’s part and parcel of the game.You kind of have to have the right mindset about something like that, but all of these things that are so familiar to you and I know, because we’ve been up and down this road many many times, many many things around the track, when you begin it’s hard to remember what you didn’t know, and that’s what I that’s what I want to step in and help them with. It’s like, yeah, you went to the career center and here’s your resume and here’s your cover letter. Let me take you the last ten percent of the way there, and that last ten percent is the difference between your resume going in the bin and your resume getting on the short list to get a phone screening, and that’s when you’re like okay I’m making progress now, and that’s what I want to give through the program. Peter: That’s great, and that’s a lot of knowledge to pass on because it might be the last ten percent, but it could be a hundred percent of that career. Peter: So you said you’ve been working on this for a while and you’re getting close, the baby’s about to be birthed. Peter: When do you think this thing will be launching? Courtney: I’m glad you asked because, believe me, I heard somebody tell me once, it was only recently, they said the last ten percent of your product program, project, whatever will take as much effort as the first ninety percent, and I thought to myself “hmm, I really hope that’s not true, because I’m supposed to have this out in January.” That was my pulled out of thin air deadline, and it absolutely is true, but it’s been a great learning experience. I have loved doing it. It has been a labor of love. I mean a baby and a birth is all the right metaphor because I have really enjoyed talking to people about the challenges, like interviewing Millennials about the challenges they face, and I’ll tell you I came across this question recently. Somebody said if you really want to know what you are about, or what somebody you’re interviewing is about, ask this question: tell me about your best day at work ever, and I had to think, okay, what was my best day at work? It really gets you thinking just kind of about everything. Was it when you made a big sale, was it when you helped somebody? Just what was your best day at work ever? Did something come to mind? Peter: Oh, when you just said that… I mean, I try to make every day one of the best days because I love what I do. I don’t think I’ve worked a day since I started this business, but I work all the time, but I would say the most recent one is when I did the closing keynote in February for White Castle, for the general managers conference, and I took some words from, and I gave her credit, from the opening keynote of Marilyn Sherman. I don’t know if you know Marilyn or not, she’ll be a future interview on my podcast, but she said “the best day ever, let’s have the best day ever,” and that keynote… okay, I’ll pat myself on the back, I kicked it. I mean that was probably one of the best… I took stuff from the whole conference, tied it all together, had interaction, and it was the best day ever. So I can think about that, and the other thing I think about it is part of my excitement for every day is when I get to do this. When they get to talk to the Courtneys of the world. I love the conversation. I’ve got another one this afternoon. Two of these, I’ll be mostly exhausted by the end of today, but once again best day. Courtney: That is absolutely beautiful, and you’re doing it. You didn’t pluck some point from way back in history. You’re living. You’re doing that now. Courtney: [laughs] That is so… because that magazine ended up being a catalog ended up being so representative of ike a point in time. That is hysterical that you worked for them. Peter: Yeah that was interesting times. Doing do what I do, anytime and I get in front of an audience, that I can make them laugh, but I can get them to have that look that go “uh-huh, I get it,” or that big aha moment. That’s best day ever. Courtney: Good for you. Do people ever come up to you after your talks, and by after your talks I mean even email you or contact you months later, and maybe refer back to something they learned and say you gave me something there and I just want to let you know you changed something for me, or you helped me in some way. Peter: Yeah, and it’s becoming more and more, and at times it just really catches me off guard. But yes, I’ve had some that really have touched me quite profoundly. That my book had this impact on somebody so much that it’s just… yeah. It’s a great feeling, and I can only imagine how many of those you get. Courtney: I’ve been fortunate enough to get a few, and every time I get that it’s always a surprise, it’s out of the clear blue sky. You get an email and somebody tells you their story, and I had one recently. This young woman emailed me, and you you speak and you look at the audience and you have some people, and maybe there’s some people you don’t have, but you go and it’s over. It’s like you have that moment with this group of people, and usually a few people come up afterwards and you connect with people that way, but I had a woman email me and she said I saw you speak last year for an international women’s day event in Canada and you talked about your TED talk, and you talked about… one of the things I do with people is to if you’re stuck or you’re not happy where you are, just set a breakthrough goal. Set one thing that if you achieved it would transform your life, and for me that actually was that TEDx talk… and she said “on that day you gave your talk and you asked us to speak up and you asked us to share our breakthrough goals and I didn’t, and I didn’t come up to you afterward, and she said but I set a goal to give a TEDx talk on that day because of you, and in two weeks I’m gonna give one. I just wanted you to know you know thanks, and this was my goal I want to finally tell you what it is.” It’s better than the day at the office. It really is. You realize it was like the guy walking down the beach throwing starfish in the water. Whatever your work is, you can’t save them all. You ever heard the story? Peter: Yeah, it makes what we do because what we do, at times, can be kinda lonely. But we get in front of an audience and we can see that we are making an impact. That just keeps that fire burning. That just keeps keeps that drive going. Peter: Courtney, I can’t believe that this has been… it feels like it’s only been five minutes. Courtney: I know, this has been good. You are so great and we go along and you’re cracking a joke and I’m like, this guy’s funny. Peter: This has been a blast. I know my audience is gonna take so much away from this, but tell the audience how they can find you. Courtney: The best place to find me probably is CourtneyKirschbaum.com. That will direct you to pretty much anywhere else you need to go. On my social media, I’m pretty active on Twitter and Facebook. Would love to see you there, and if any of your audience members are getting ready to job hunt, or know someone who is, right now we have a splash page up for Job Hunt School and you can sign up. So when that launches, if you want to see what that’s about or you know someone who might benefit from it, sign up and you’ll get the word and you can check it out for yourself. Peter: That’s great. Thank you so very much. I will put all this information about job hunt school, all8 the links and stuff, in the show notes, and Courtney it’s been an absolute pleasure. Courtney: Same here, Peter. Thank you so much. I would like to thank Courtney again for taking time out of your schedule to give us her thoughts on assimilating into the corporate world from college, as well as dealing with all the office politics. You can find out more about Courtney on our website, CourtneyKirschbaum.com, or email her at Courtney (at) Courtney Kirschbaum (dot) com. In episode 45, I interview Rosemarie Rossetti, who is a compelling speaker who transformed her tragic experiences into life lessons. Through her keynote presentations, she helps her audiences discover their inner strength. Her core message is focused on success strategies and life lessons that can provide the tools to live life with conviction. Remember, you can subscribe to my podcast on itunes, stitcher, and google play. If you’d like to purchase a personalized autographed copy of my book Improv is no Joke: Using Improvisation to Create Positive Results in Leadership and Life, for $14.99 with free shipping, please go to my website, PeterMargaritis.com, and you’ll see the graphic on the homepage to purchase my book. Please allow 14 days for shipping. Thank you again for listening and remember to use the power of adaptability and Yes, And to grow your career.